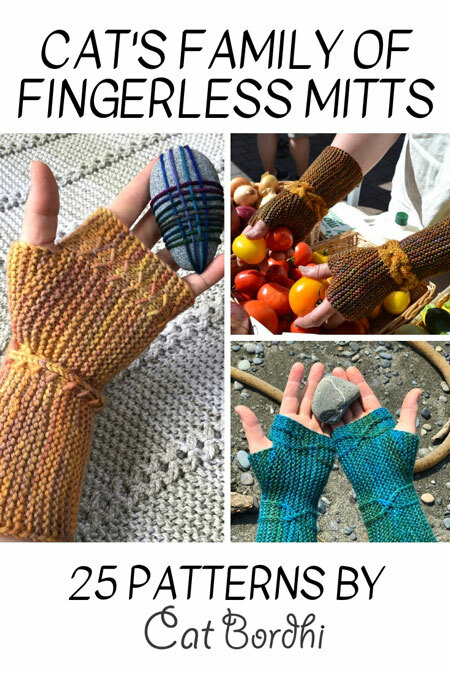 Purchase this eBook with all 25 patterns and live video links. 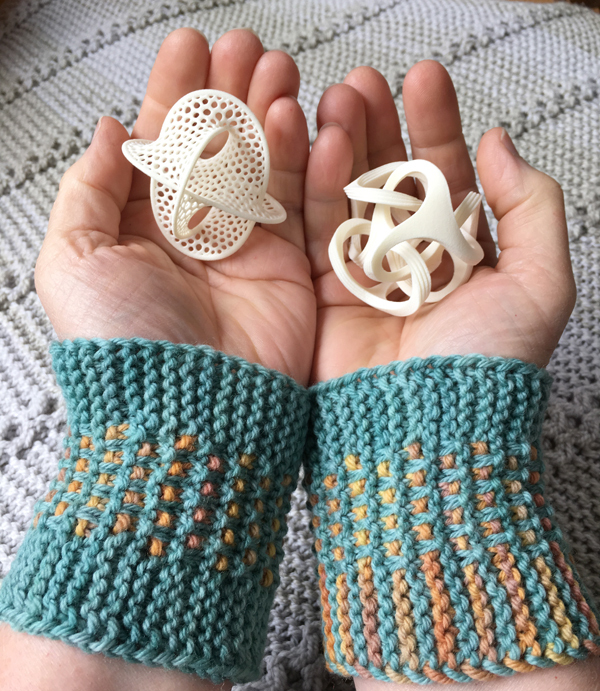 This ebook is a set of 9 Folios, each one a separate PDF with several related patterns, which makes the large collection of 25 patterns user-friendly. Your purchase includes all the Folios, including any I may add in the future. 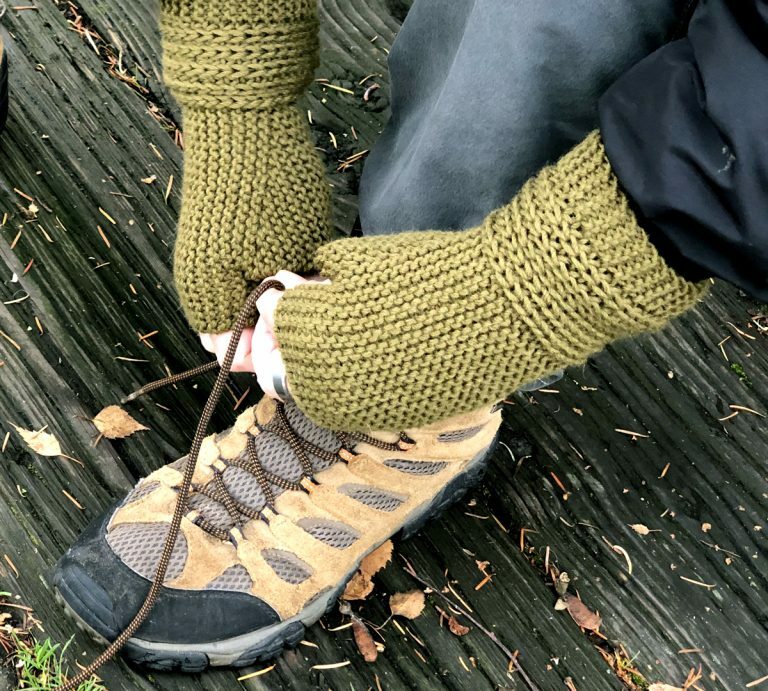 Folio One includes a 15-minute Tiny Mitt video, to accompany you through the basics as if we were sitting side-by-side. 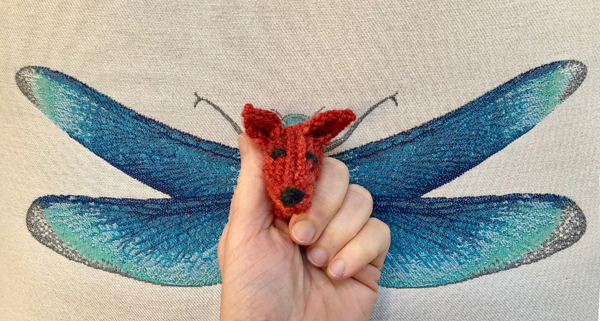 The Tiny Mitt can even become a finger puppet. Instructions are included. 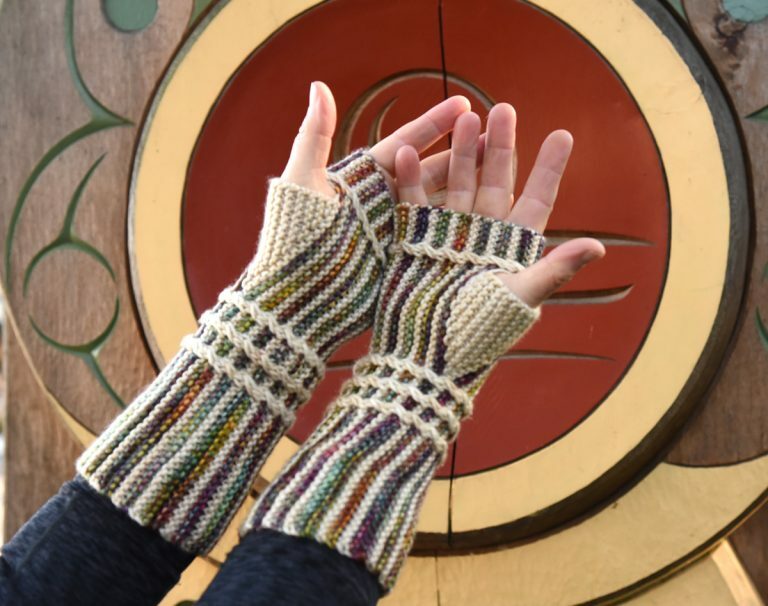 The Pure Garter Stitch Mitts are the simplest design of all and a handprint makes each pair unique. 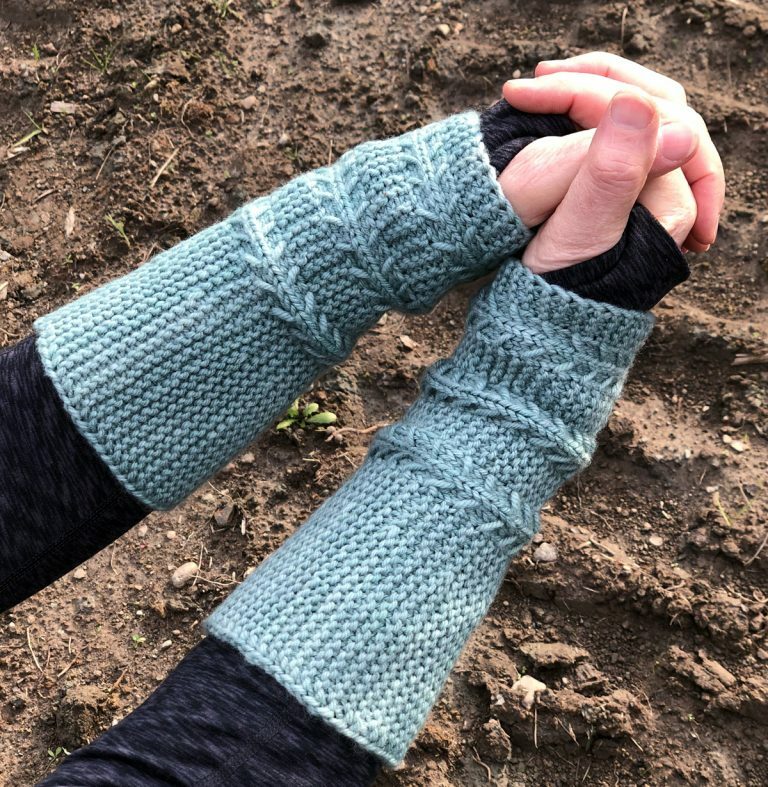 The Long Pure Garter Stitch Mitts look great with the cuffs folded up. 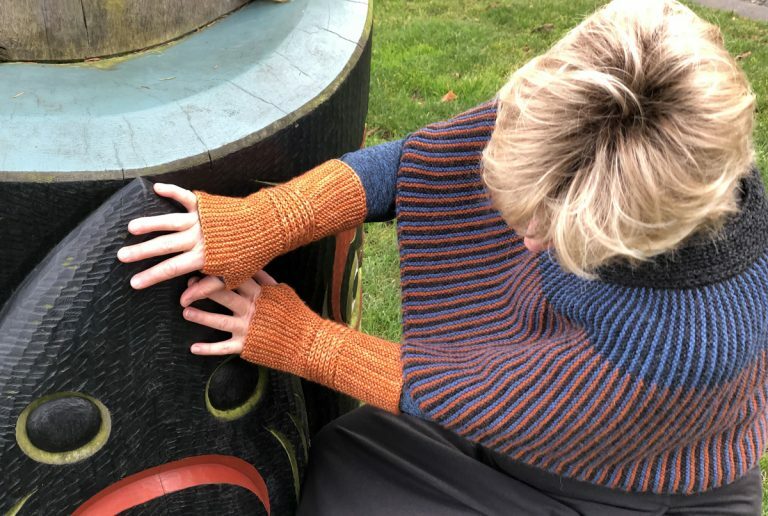 Folio Two—Simple Pleasures, offers patterns for those who do not feel ready for more complex designs. 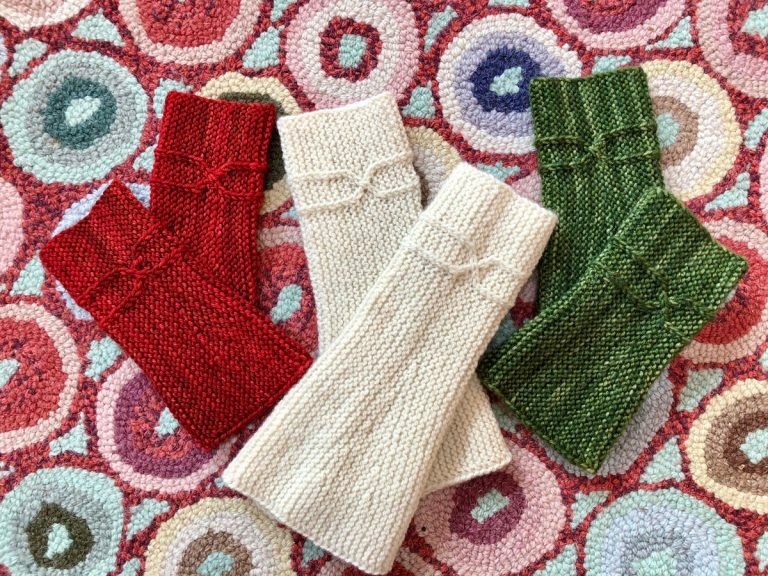 The Striped Garter Stitch Mitts use half a skein of each color, so you can make 2 pairs with 2 skeins! 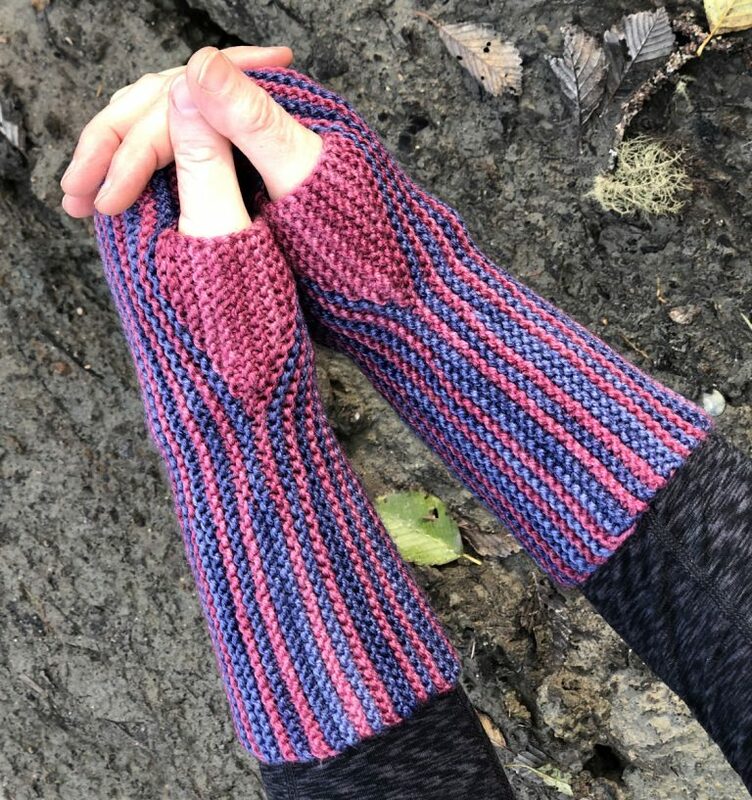 These shorter, Extra Cushy Striped Garter Stitch Mitts are knit of Abundant Earth Fibers yarn which is so squooshy and bouncy and elastic that this pair fit both me and my young grandson’s slender hands. The Oh, Pshaw! 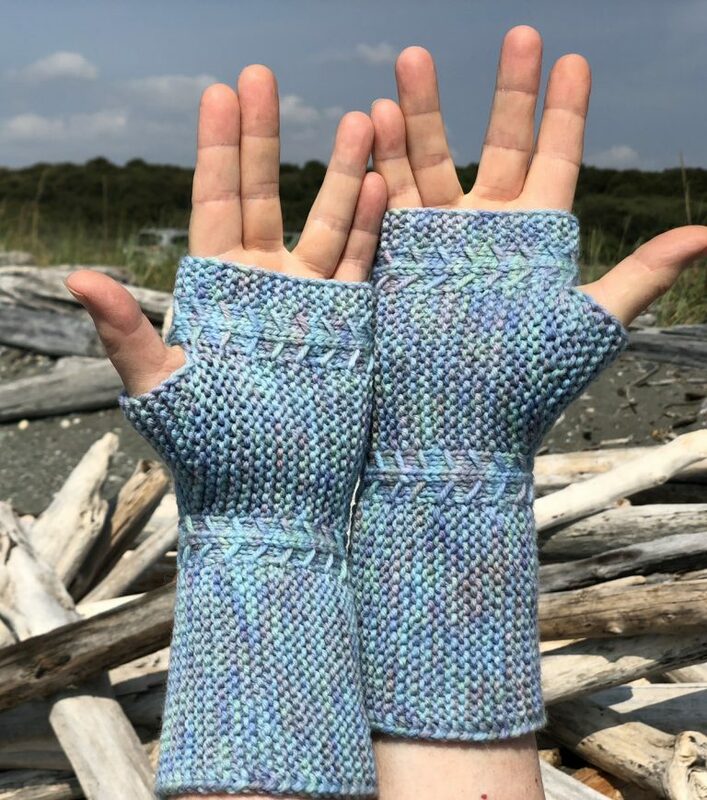 Mitts have simple lace panels in the arm and if you attend one of my Island Knitting Retreats, we’ll go for an afternoon cruise among the four ferry-served islands and you’ll learn how and why I named these mitts. 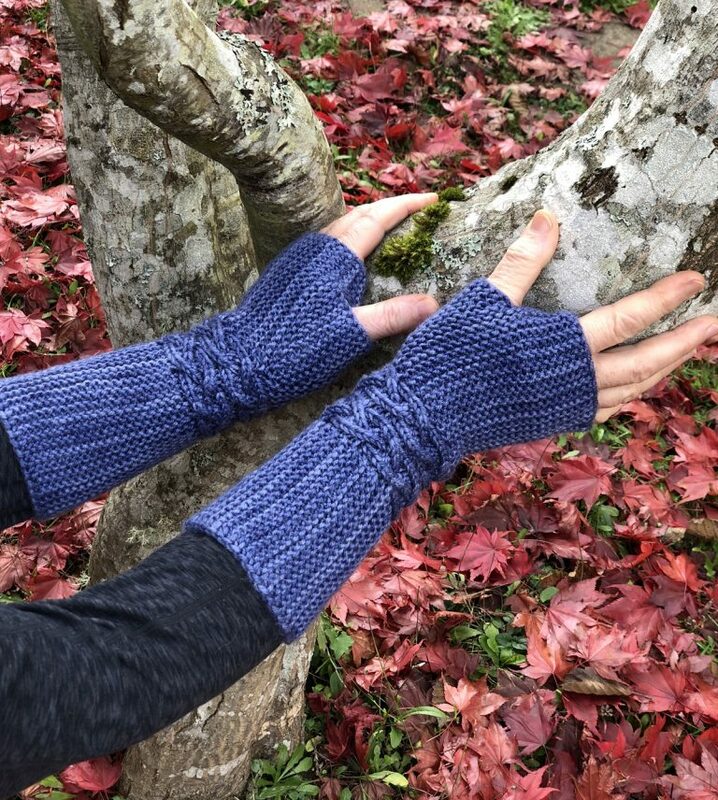 The Zen Garden Mitts and Cuffs in Folio Three feature a design reminiscent of the serene rake lines in the sand of a Zen garden. 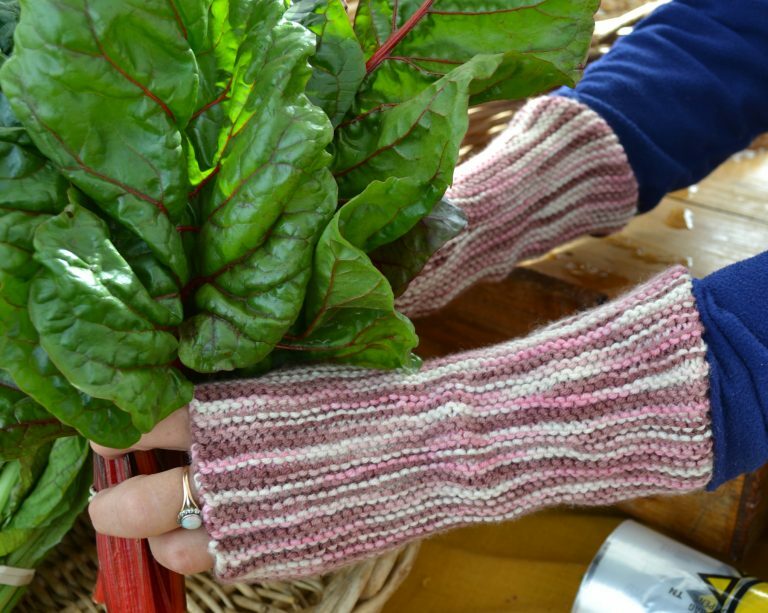 If you lend the Short Zen Farmer’s Mitts to your photographer he will hesitate to give them back. 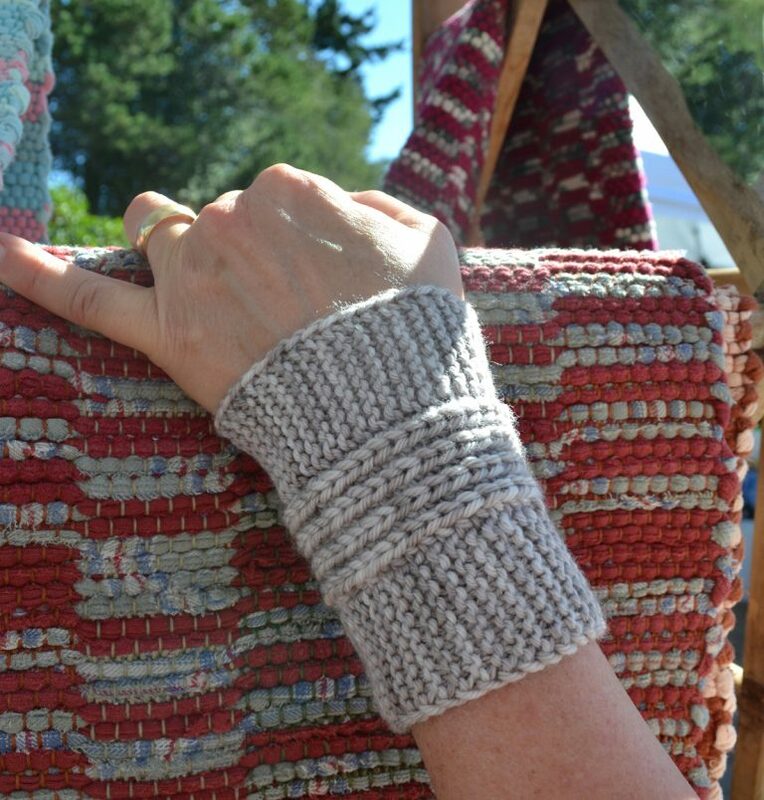 And these short Zen Garden Cuffs will keep you surprisingly warm too. 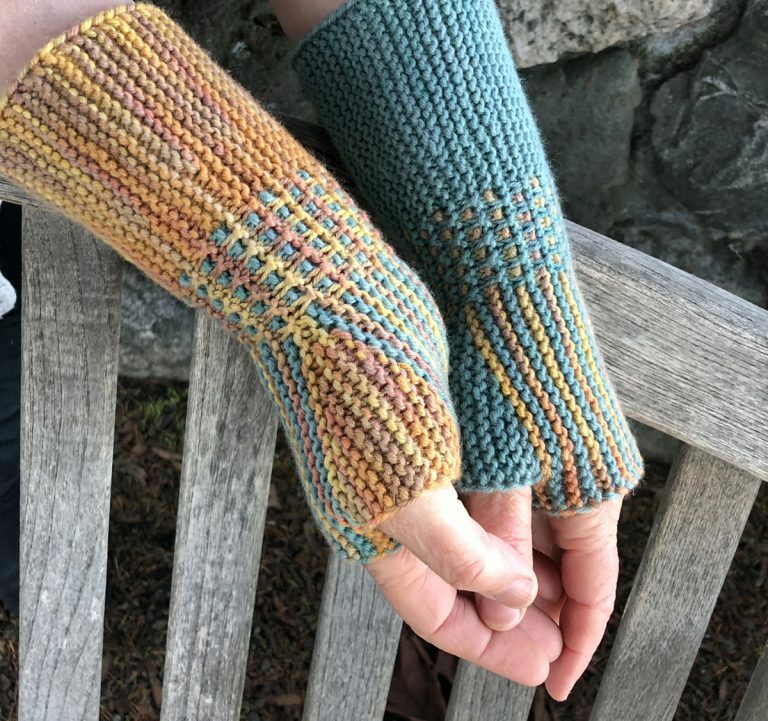 A great quick gift. 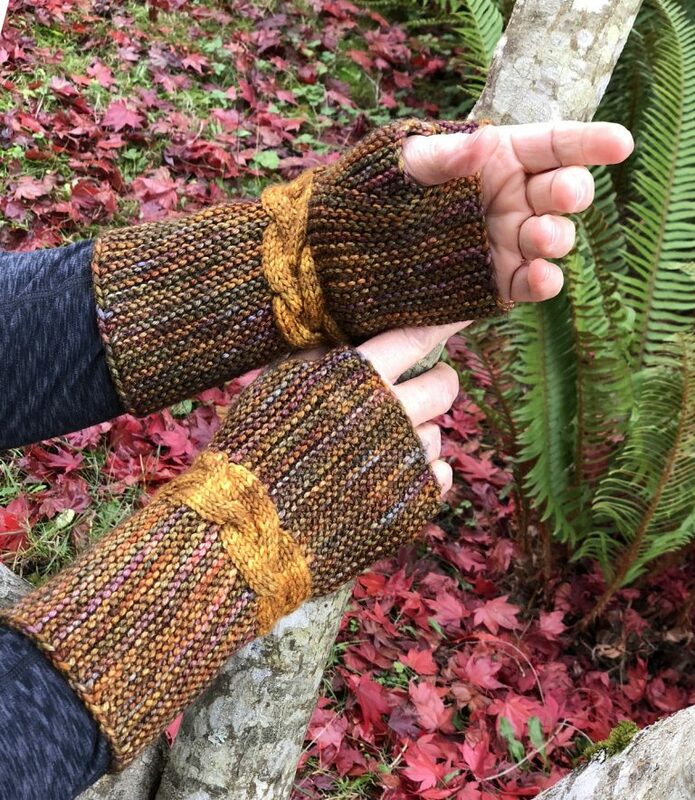 The Rapunzel Mitts in Folio Four have a thick braid around the wrist, inspired by childhood memories of wondering exactly how Rapunzel escaped her tower via her long braid (I never considered letting the prince assist). 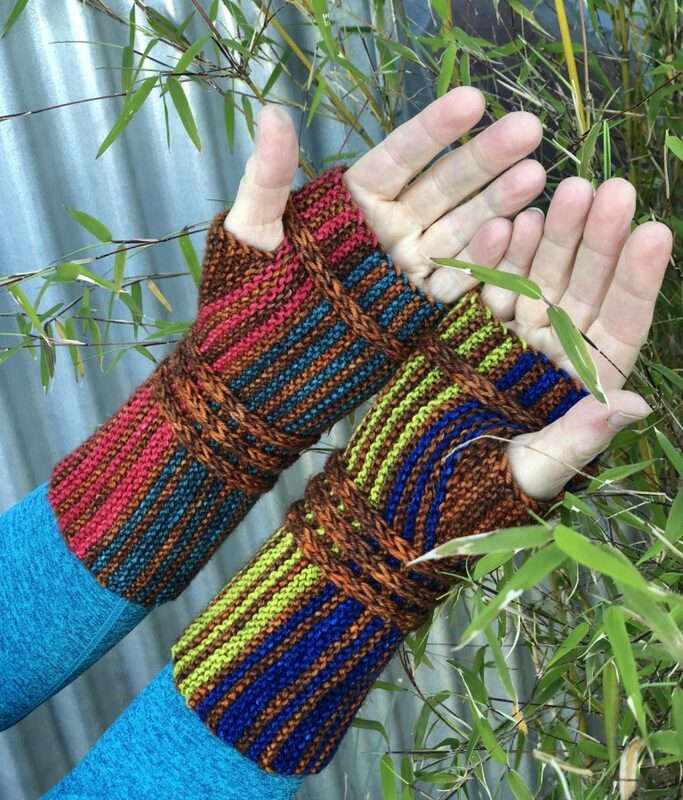 This pair has a cuffed top. 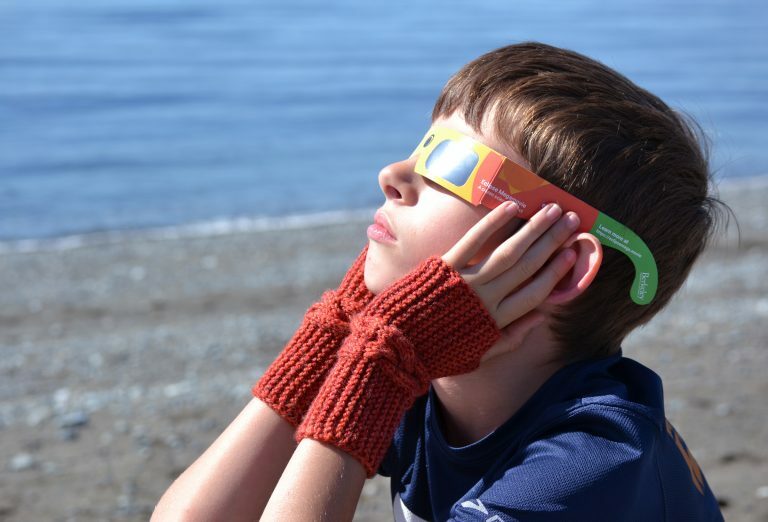 You’ll find multiple sizes. Everyone in the family can have their own. 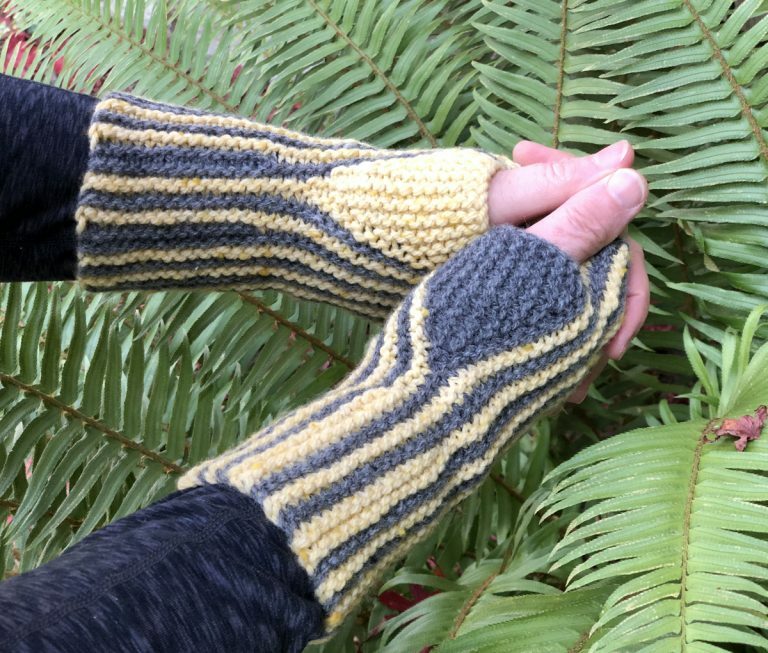 And a version with a contrast color braid, the Golden Braid Rapunzel Mitts. 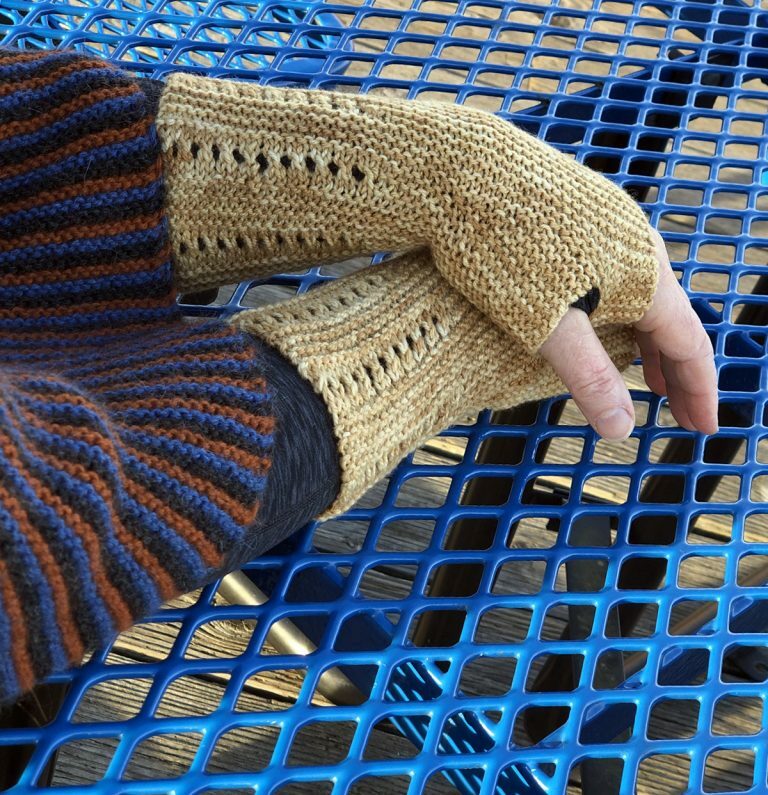 The Elegant Mitts in Folio Five use two colors to form vertical stripes and bracelet-like rings around the wrist. 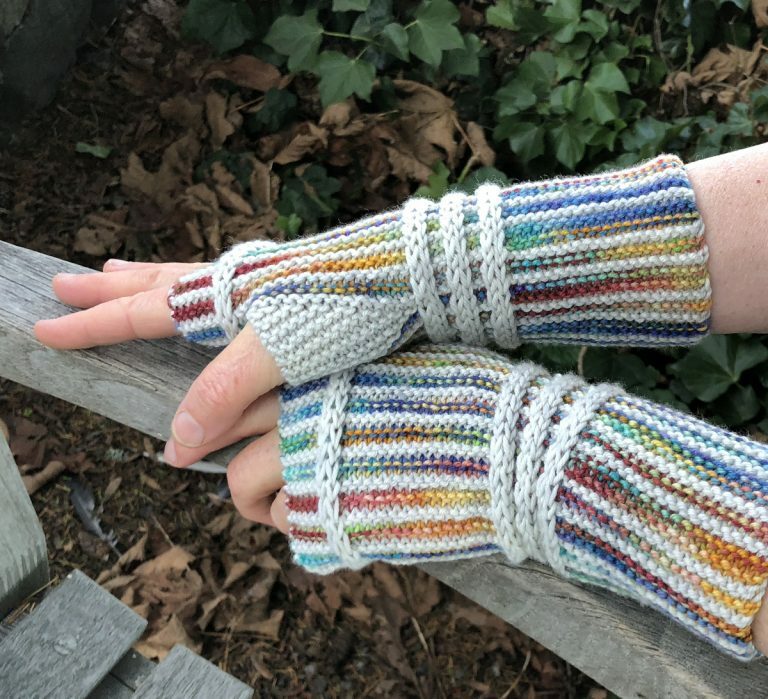 Here are the Rainbow Mitts. 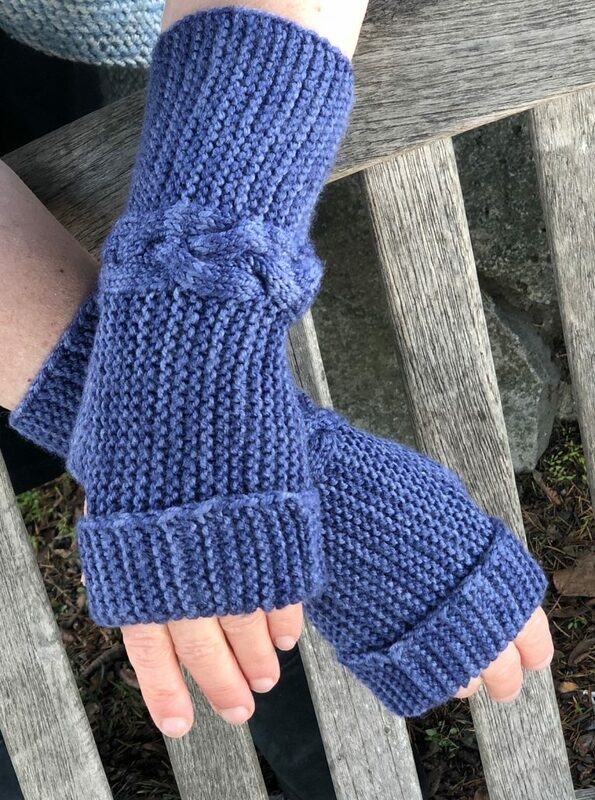 The Cabled Cumberland Mitts have lovely small cable twists. 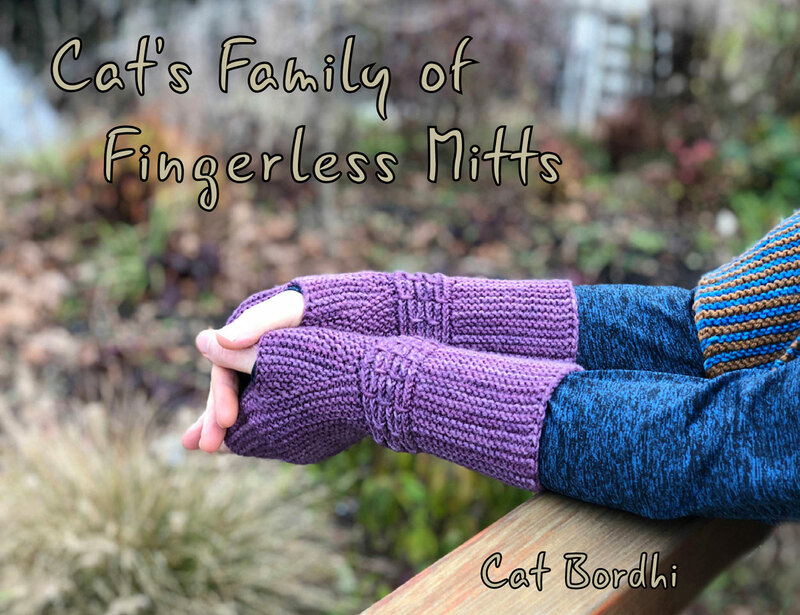 Finally, the Stash-Buster Mitts let you dig through your stash and use up all kinds of odds and ends. 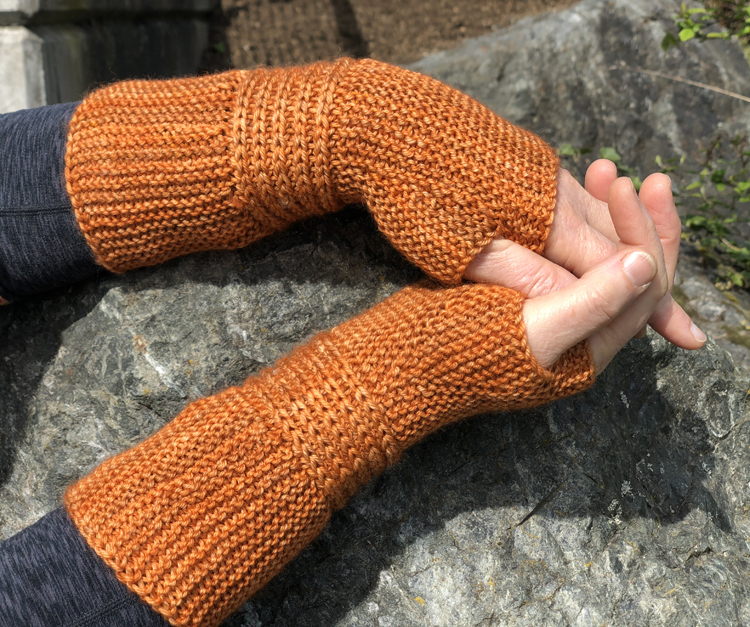 The Sesame Mitts and Pulse-Warmers in Folio Seven invite you to choose two skeins of contrasting yarn and knit 2 pairs of mitts and 2 pairs of short cuffs (pulse-warmers)—and to give some away! 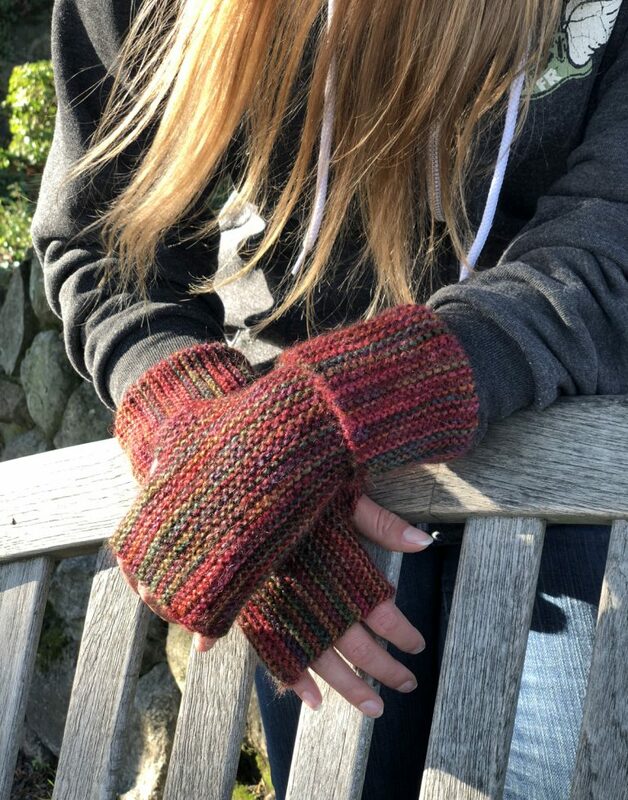 The Mountain Mitts and Gauntlets in Folio Eight have two decorative bands, one around the wrist and one at the base of the fingers. 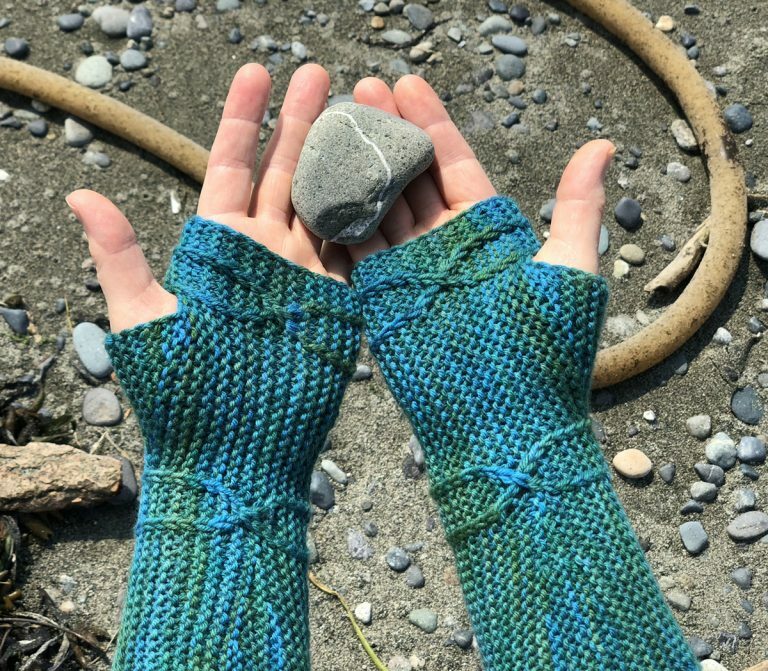 The arrowhead design will quickly teach itself to you and provide a steady rhythm to your knitting. 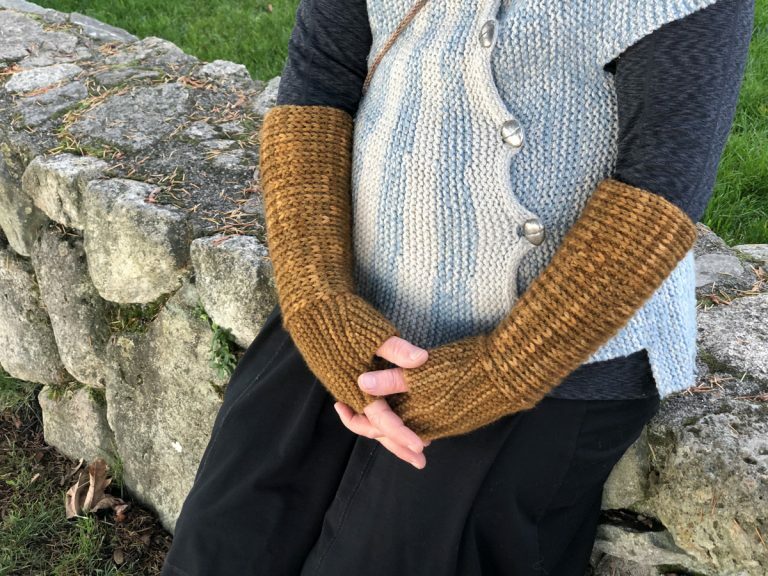 The Running Waters designs in Folio Nine are the most challenging in the book, and oh so beautiful. 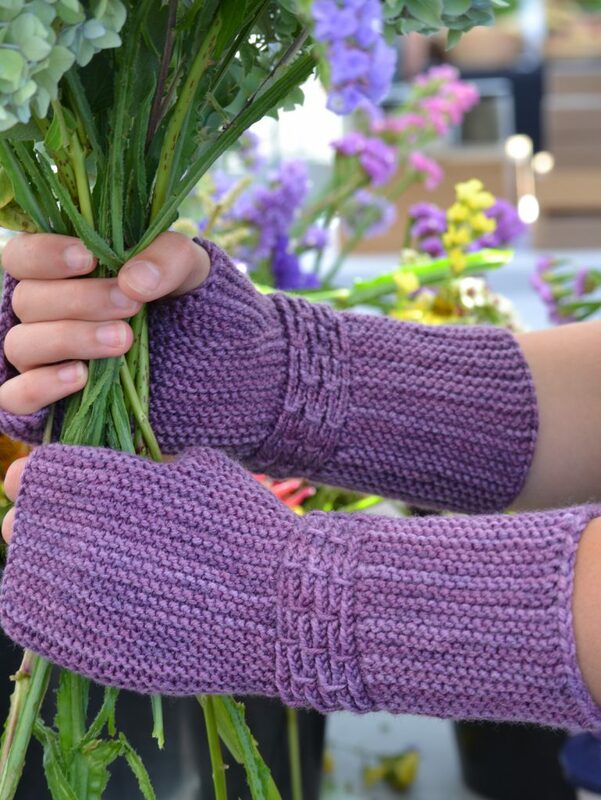 Here are the Purple Pulsera Mitts. And finally, the final mitt of the book, the Windblown Waves Mitts.